Gates are physical portals that serve as the entrance or boundary of a place. They may be sparse or intricately-constructed, but they usually serve another purpose: gates announce to people what’s behind them, and sometimes give people their first impression (whether intentionally or unintentionally) of the nature and character of a place. We at Cacciola Iron Works know how gates can project a feeling, an idea, or a vibe; and how they are actually an important visual element for construction and design. 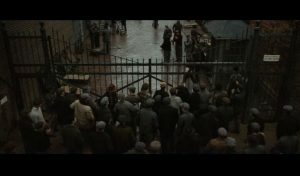 In movies and television shows, they impart the mood of a setting, and are carefully designed to be either historically accurate or visually suggestive and engaging. We present to you four of the most iconic and recognizable gates from the big and small screen. Toronto Distillery Gates: Used as the gates to the New Jersey dockyards in the 2005 movie Cinderella Man, This rather simple-looking gate was the used as the focal point for scenes showcasing the depression era. This historical location in Toronto has also been used in a multitude of other movies, such as X-Men, Blues Brothers, and Chicago. 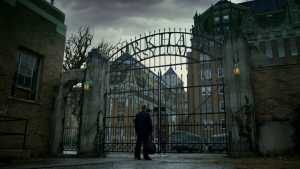 Arkham Asylum Gate: This gate, seen in front of the infamous institution where many of Gotham’s darker characters have become inmates, heightens the foreboding atmosphere of the show. The production crew added pillars and the imposing gate in front of the parking lot of the TV show asylum’s actual location: Staten Island’s Bayley Seton Hospital. These are then removed when the show isn’t filming. 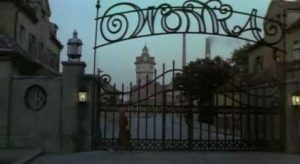 Wonka Chocolate Factory Gate: 1971’s Willy Wonka & the Chocolate Factory gave us this iconic façade of the factory’s gate with the titular character’s name wrought above. The factory’s actual location was in Stadtwerke München, Emmy-Noether-Straße, Munich, Germany, and the building used in the movie still stands; although it has a different gate now. 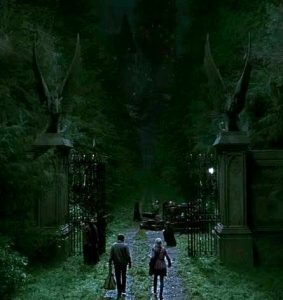 Hogwarts Gate: This iconic wrought-iron gate is our first glimpse of the legendary school that Harry Potter and his friends attend: the gate is flanked by pillars with statues of winged boars. The main exterior locations for Hogwarts are Ainwick Castle and Durham Cathedral, but the production crew simply built the gate and situated it outside the locations’ grounds. It now resides in Warner Brothers Studios in Leavesden, Hertferdshire in London as one of the exhibits in the studio’s tour. Do you need your very own iconic gate that will uniquely project your personality? Contact us and our professional team of ornamental and iron workers with over 35 years of experience, and we will craft a personal portal for your estate which is also a work of art!